I was disappointed with Fire Study, to put it mildly. I had expected much more and in the end I finished it, more because I felt I ought to, than because I was truly engrossed. The story is an absolute mess and the red thread that's supposed to keep the whole thing together got lost within the first 50 pages. I didn't find it clearly again till page 400. Maybe I'm just exceptionally thick, but I could not keep track of all the confusion, the repetition, the constant change of minds, the lack of explanations to what was going on or why and abundance of stuff happening. It was confusing and frustrating reading this book, and only the last few chapters returned to the same flow that made me love Poison Study. I can't figure out if Snyder never wrote an outline for the story and just wrote it as it came to her, thus resulting in the tangled mess, or if she just expected her readers to understand all the things implied perfectly and thus be able to follow the story she tried to convey. The writing, the style, has also taken a turn for the worse. The tone seems off, and it often feels like you're reading the commentary rather than what's actually happening. You don't feel with or for any of the characters. Things happen and you don't care. Obviously I can't tell you the specifics of all my annoyances and disappointments with the book, without spoiling it completely, but I can tell you that I only properly enjoyed the final few chapters of the book - the rest were too jumbled. 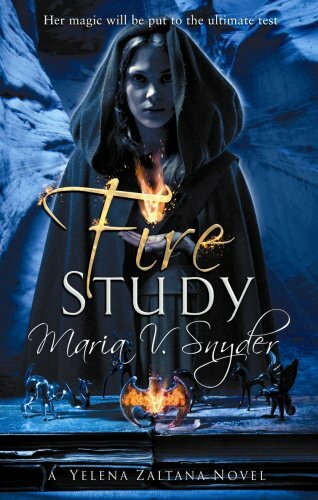 As in book 2, Magic Study, simply too much have been crammed in to this book. After finishing it, I can see the general idea of the plot and how intricate Snyder intended it to be - unfortunately it's just too much. 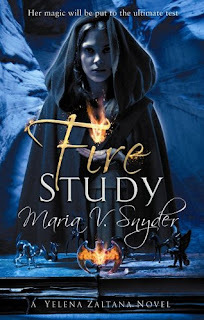 I don't know if maybe she was limited to a certain amount of pages (Fire Study consists of 441 pages), but maybe it would have done the story some good, if it was 200 pages longer and allowed for time to pass, silent moments to exist and gave the reader the opportunity to digest. As it is, the second one thing is done with, another explodes and the characters rush off to deal with that, and it's simply too much. Character-wise, I'm disappointed as well; people who were fresh and plausible in the first and second book, have frozen into stereotypes of themselves and seem unable to do anything but what Yelena expects them to and finds them capable off. Their personalities are all over the place. The bad guys are still ravenous for blood and basically incapable of anything but being psychopaths. Valek is once again Yelena's stud (only implied, never graphic) who happens to also be handy in a fight. Yelena herself is almost impossible to understand or feel with as she spends most of the book, seemingly unable to even understand her own actions. The Soulfinder concept introduced in Magic Study and explored in Fire Study is interesting, and I wish Snyder had used it better throughout the book, instead of sending Yelena through a stumbling path to enlightenment. The book gets 2 stars, hovering on the edge of 3, but only because I still like the overall concept of the story and the world it takes place in. Snyder could have done so much better - she proved that with Poison Study. >>The story picks up shortly after the events of Magic Study leave off. Yelena, her brother Leif, and the mercurial Moon Man are busy trying to mop up the Soulstealer's mess and dealing with accusations from the Mage's Council. First Magician Roze Featherstone is calling for Yelena's head on a platter and there is little rest for the weary on the horizon. The problem is, very little happens from this point on. Or rather, very little new stuff happens. Oh, I hate it when that happens in a series of books. Have you read the Inkheart trilogy? I loved the first two, but the third one was so disappointing in the same way this book was for you, and it ruined the whole series for me. I've seen the Inkheart film, from what I could understand it more or less covers all 3 books. Can't remember much of it though lol. Thanks again for linking to my review, Noia! I still shake my head over this one because I really loved POISON STUDY so very much. What in the world happened to make it go downhill so quickly after that? My thoughts exactly Angiegirl! You've got to wonder what could cause an author to drop the ball like that.. I too was disappointed in the end of this series. Although it was nothing compared to how her Glass series ended.